Starting next week the halls of polyclinics and hospitals will welcome the citizens not only with price lists for services, but also with posters telling if the citizens can apply for their treatment free of charge. The United States Agency for International Developments office in Yerevan (USAID) has sponsored the publication of the posters which were distributed throughout 550 medical institutions in Armenia. The list of people that can apply for the state order includes physically challenged people as well as their children under age 18, veterans of WWIII, Karabakh war and Chernobyl, children under age seven, people who live below the poverty level, and other groups. The system of “state guarantee order” as well as the whole healthcare system was well developed in Armenia during Soviet times, when Armenia annually received some $300 million from Moscow for healthcare. However the following years of post independence economic conditions has led to decay in the medical system, including failure to pay healthcare workers’ salaries for months at a time. The result has been that some workers have devised ways of taking advantage of state-ordered care of the indigent or vulnerable. Some doctors take money from patients, promising to get the appropriate papers from the Ministry of Health to make a surgery free of charge – for a service that should be free, anyway. Others take money from the government for the treatment of fictitious patients. Ruslana Gevorgyan, the head of the information department of the Ministry of Health assures that if a physician is found guilty of taking bribes he might be deprived of a health license. The ministry has set up a hot line to receive complaints (52 15 59). According to the ministry, each year about 150,000 people get medical treatments by state order. 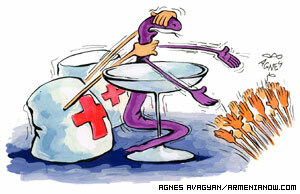 This year the health budget allocated 18 billion dram (about $30 million) for state order medical service. Officials of he Ministry of Health say that within the following years they intend to increase the amount for the state order treatment by more than 40 percent. Gevorgyan says that directors of hospitals and polyclinics in Armenia were repeatedly urged by the ministry to post information concerning the free treatment of and privileges for population. However such information could be hardly found in any of 50 hospitals and polyclinics of Yerevan. In most medical institutions the decisions over the prices of treatments are being made confidentially between the family concerned and the doctor. Now if the government will keep its promise to become a third part of that relationship many people will get a chance for qualified healthcare – a service that was provided by law for all but practiced for only some.